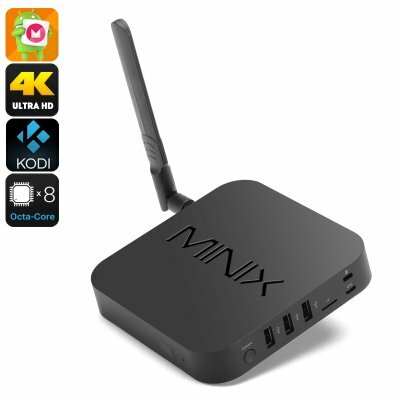 Successfully Added MINIX NEO U9-H TV Box - 4K HDR, Dual Band Wi-Fi, Dolby Digital Audio, Kodi, Octa Core CPU, Android OS, Gigabit Ethernet to your Shopping Cart. The Minix U9-H Android TV Box is a real powerhouse with an Amlogic S912-H CPU and 2GB of RAM you can use this Android mini PC for work, play and of course video entertainment. The 2GHz Octa Core processor delivers pure unadulterated processing power for this small box. This compact Android computer has full Google Play store access lets you choose from over a million apps and can be easily customized with all different kinds of launches widgets and setups so you optimize you layout for quick access to all your favorite apps and media. If you grab the Minix NEO A3 wireless controller/air mouse you can take advantage of the voice search ability of Android making it super easy to input text in just about any app. So no more typing. Just hit the voice to text icon and issue your commands. For those with a 4K TV then there is even more reason to buy the Minix Neo U9-H Android TV box as it will let you enjoy UHD video for picture perfect quality. Supporting 4K HDR (High dynamic range) brings a wider color spectrum with greater contrast between darks and lights that will accentuate the viewing experience with more natural tones. Now you can enjoy life like images that will burst from the screen letting you delight in an immersive and seamless viewing experience. The Dolby support also extends to the audio so you will really notice the difference between the Minix NEO U9-H and other TV Boxes. With Dolby Digital Audio the NEO U9-H delivers a vibrant and stunning audio quality that's unsurpassed and will bring all your entertainment to life. A large Wi-Fi antennae along with its 802.11ac 2x2 MIMO Dual Wi-Fi ensures stable and fast wireless network connectivity. Along with the gigabit Ethernet port, the NEO U9-H TV box can deliver seamless streaming without interruptions for buffering or dropped frames. There are 16GB of internal storage that can be expanded by connecting a micro SD card, memory pen or external HDD. The cutting edge Minix NEO U9-H Android TV box comes with 12 months warranty, brought to you by the leader in electronic devices as well as wholesale Android TV boxes..